Cyanides are employed in a number of chemical processes, including fumigation, case hardening of iron and steel, electroplating, and the concentration of ores. Electrolytic metallurgy is one of the productions which have the serious influence on contamination of the environment, particularly by heavy metal ions. The main supplier of toxicants in electroplating is cleaning-purposes water. At the same time this water is the main source of wastewater. By the reason of imperfect washing method is released the large volume of wastewater. (The known washing method requires up to 2 m3 of cleaning-purposes water for washing 1 m3 of details). The wastewater from electroplating shops contains toxic pollutants such as cyanogen, chromium, copper, lead, acid, alkali and others. The most toxic industrial wastewater is that which contain simple cyano-compound (with ions CN—), combined compounds [Cu(CN2)—], [Cu(CN3)-2], [Zn(CN4)-2]. General concentration of simple and combined cyanides is ranging from 10-15 to 150-300 mg/l. To neutralize the high-toxic cyanides (simple cyanides, ammonocarbonous acid, compound zinc cyanide, copper, nickel, cadmium) need to apply oxidizing by reagents which contain available chlorine. Reagent method is wide used for cyanides neutralization. For example, cyanides can be neutralized by oxidization using calcium hypochlorite Ca(OCl)2 or chloride lime CaOCl2,or gaseous chlorine. On the enterprises the most of cyano-containing wastewater is neutralized by means of intermittently operating plants. In these plants reagentizing is made in tanks which are filling one-by-one. Large amounts of wastewater are treated by using continuously operating plants. The reaction proceeds in 2 stages. Stage 1 changes cyanides to cyanates (pH level is equal to 10÷11,5). In stage 2 cyanates hydrolyzed to nitrogen and carbon dioxide (pH level is equal to 7÷7,5). Utilization of AVS unit (Intensifier of Technological Process or Magnetic Vortex Activator) gives a possibility to combine oxidization of cyanides and its decomposition to carbonate and ammonia in one stage on following conditions: reaction proceeds in alkaline medium, pH level 9÷10. In the industrial implementation of the proposed method cyano-containing wastewater is fed to an equalizing reservoir from the source of their creation. Passing the reservoir these wastewater are pumping into the AVS unit. At the same time alkaline agent and oxidizer are fed to the working chamber of the unit. The signalling indicator of cyanogen and pH-meter are controlling pH level in the AVS unit and cyanides residue level. From the AVS unit the wastewater fed to collector where they mix with neutralized wastewater obtained from other electroplating shops. As alkaline reagent can be used lime and soda in the form of 5-10% solution. As oxidizer can be used calcium hypochlorite or sodium hypochlorite, chlorine or chloride lime. The oxidizer consumption is on level 110% from stoichiometric prediction. In the table 1 you can see the result of investigations obtained during the testing of AVS unit on cyano-contained wastewater treatment. The productivity of this unit is 12-15 m3/h. It was observed that the quality of treatment is not depending from the concentration of cyan-ion in the initial wastewater. 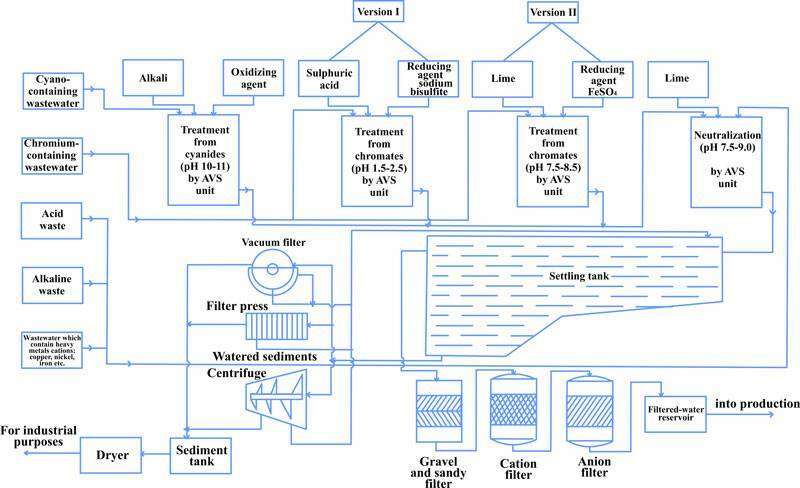 Engineers from PC GlobeCore have investigated and implemented in real electroplating shop the process flowsheet of uninterrupted and simultaneously wastewater treatment from cyanides, cyanates and hexavalent chromium compounds. III – simultaneous wastewater treatment after mixing neutralized chromium-containing wastewater and cyano-containing wastewater with acid-base wastewater. To wastewater demineralization is used the gravel and sandy filter, cation and anion filters. Passing all these filters the water is fed to the filtered-water reservoir and into production. Offered by us wastewater treatment methods are very effective and some of them allow reduce reagent consumption in 1.5-2 times, reduce energy consumption in 2 times and decrease working area of treatment facilities in 10-15%. 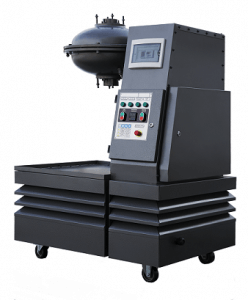 PC GlobeCore is combined of scientific research, engineering design, technical service, product development and manufacturing. You can be sure – all our products are based on breakthrough technologies and are environmentally friendly, tested by qualified engineers, fit for use and are so simple to operate that you will need only one operator.